This post is courtesy of our contributor Michelle…Here in the US, Thanksgiving is the 4th Thursday in November. I have a fun Thanksgiving activity to share with you today – Thanksgiving placemats! Activity placemats are perfect for keeping those little hands busy at the kiddie table. Complete with tic-tac-toe, word scramble and even a coloring corner! Just print as many of the free Thanksgiving placemats as you would like for those little helping hands! It’s a great quiet activity for kids to play while you are cooking and entertaining. You could place a few crayons at each place setting for the kids to use – perhaps displayed in a cute way that the kids could also take home as a favor. We’d like to extend a big Thank You to Michelle for sharing this fun printable with us. Follow Michelle’s Party Plan-It on Facebook, Pinterest and Instagram for even more creative & unique ideas for parties! Looking for more fun ideas for Thanksgiving? Check out our Thanksgiving Fun page for more free printables, games, loads of recipe ideas, party ideas, cute crafts and more! We’re always adding new ideas for celebrating the holidays with your family. 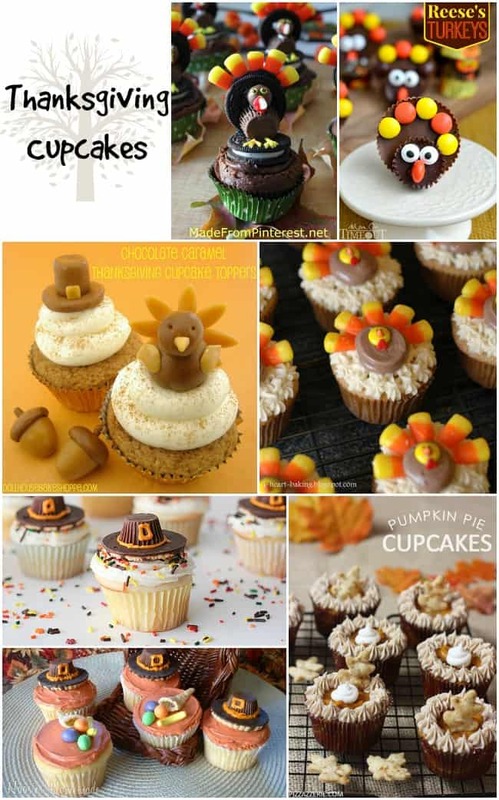 Here’s a sneak peek of one of the Thanksgiving posts you’ll find here on Moms & Munchkins – a creative collection of Thanksgiving cupcakes that all ages will love. I’m sure you’d have just as much making these as your guest would have while eating them! We’re always adding new ideas for parties & family celebrations. We always welcome your suggestions as well so please contact us if you’d like help brainstorming ideas for your next party. For the latest ideas, follow us on Facebook, Twitter, Pinterest, Google + and Bloglovin’.